While picking up produce at my local food co-op yesterday I noticed something out of the ordinary on the extras table – a dozen or so young Thai coconuts. It was a first for the co-op and a treat I hadn’t had in a while; so naturally I grabbed one. Young Thai coconuts our best known for their delicious electrolyte rich water, but also contain a little meat. You can make coconut milk blending the water and meat, which is perfect for smoothies. Here’s a few of the health benefits of young Thai coconuts. The water is extremely rich in electrolytes – perfect during or after an intense workout. The water is actually identical to human blood plasma and was used in World War II for emergency plasma transfusions to wounded soldiers. If you’ve never had a young Thai coconut I urge you to give one a try. You won’t find them at your local grocery store. Health foods outfits such as Whole Foods and Asian markets are your best bet. It does take a little skill to open one. 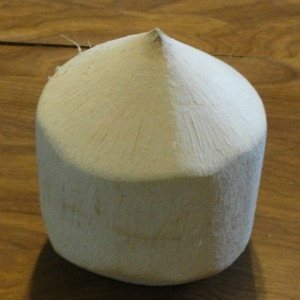 Here’s a video with instructions on how to open a young Thai coconut. Young Thai coconuts contain varying amounts of water and meat, which is part of the fun of opening them to see what you get. Tailor this smoothie recipe based on how much water and meat you get out of you coconut and how thick you like your smoothies. Enjoy! Let me know what you think of this young Thai coconut smoothie, or your experience with young Thai coconuts in the comments below. Happy Blending! Hi Walter, glad you like the recipe. Thanks for the heads up on the coconut buddy, that little tool looks quite handy. Cheers!